Title: 'Ins Kleine Gebrachte Karte von den Sud-Laendern zur Histoire der Reisen'. A very uncommon and desirable early transitional map of Australia that was published a decade before Cook's first voyage. 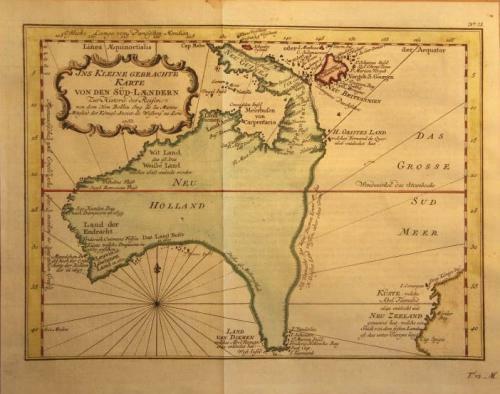 Based on Dutch discoveries, it hypothesises an unbroken coastline from Tasmania to New Guinea. In the bottom right corner is the partial outline of New Zealand, unvisited for over a century. The map is in excellent condition with only a very slight toning.